Apraxia of Speech is a neurological disorder that occurs when the signals from the brain are jumbled up before reaching the childs mouth, resulting in difficulty choosing or forming words, or the complete inability to speak despite the fact that they are physically capable of understanding speech and have the proper muscles, oral structure and breath control to create spoken words. With the children available for adoption the concern essentially is with the childs ability to coordinate speech patterns or plan motor activities. Muteness is an inability to speak that is triggered by a physical disorder or stress-related situation, hearing loss or physical deformity of the oral cavity like severe cleft palate, severe cases of Ankyloglossia (being tongue tied) or tumors of the lips, tongue or mouth. With children from orphanages, or children making sudden and drastic life/caretaker changes, this condition can become apparent. Extreme stress or anxiety can affect children by robbing them of the ability to speak until the situation is resolved for the child. 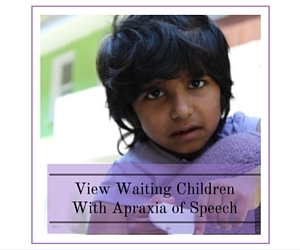 Speech therapy can be used to help children with Apraxia of Speech or Muteness improve their oral skills. Older children can be taught to write or use sign language to express themselves.